Cette page a pour objet de présenter des articles qui concernent la vie quotidienne, l'histoire et l'actualité de l'arctique. Ces articles peuvent être rédigés en Francais ou en Anglais, et sont publiés avec l'accord de leurs auteurs. The Gwich'in Athapaskan language has also been known as Loucheux, Kutchin and Tukudh. It is used in Northern Yukon, Northeast Alaska and Northeast N.W.T. The people of the Gwich'in community of Old Crow call themselves the Van Tat-Gwich'in, or people who live among the lakes (ie., Crow Flats)" (The language is referred to as Kutchin, or Tukudh.) Settlements are Fort Yukon, Chalkyitsik, Birch-Creek, Venetie and Arctic Village. Other speakers live in the North West Territories: Aklavik, Inuvik, Arctic Red River and Fort McPherson. The Gwich'in Language has been taught in the Chief Zzeh Gittlit School in Old Crow since the early 1970's. The current instructors are Mrs. Helen Charlie and Mrs. Annie Lord. Gwich'in classes are attended by virtually all the students during the year. The first writing system for the Gwich'in or Tukudh language was created by Archdeacon, Robert McDonald (1829-1913), a church of England missionary who began working with the Gwich'in people in the 1860's. With the help of the Gwich'in people, McDonald translated the entire Bible, the book of Common Prayer, and a book of Takudh Hymns. These books are still being used today by middle-aged and older people who were taught to read and write the McDonald alphabet. Most of the younger people have a difficult time reading the materials because the symbols used by McDonald were inconsistent. Today young people can rely on a modern writing system that reflects more accurately and consistently which was developed by Richard Mueller, a linguist and Bible translator. The Mueller alphabet for Alaskan Loucheux was adapted by the Yukon Native Language Centre since the mid 1970's for use in writing the Canadian dialects of the language. Me too, I'm fine....... Shint'eh sheenjit gwiinzii. I live in Old Crow................Old Crow gwihch'ii. 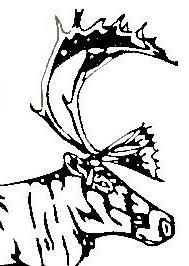 Who is this?.............................Jii jùu t'iinch'uu? This is my mother.............Jii shihanh t'iinch'uu. This is my father...................Jii shiti' t'iinch'uu. This is my grandmother....Jii shitsuu t'iinch'uu. This is my grandfather........Jii shitsii t'iinch'uu. The North is home to two dozen aboriginial languages, from those in Athapaskan family (most of the Yukon's 14 languages and many of the NWT's) to those rooted in the history of the Inuit. The occasional pocket of other first nations' tongues, such as Tlingit in the Yukon and Cree in the NWT, have also contributed to the rich linguistic heritage of the North. 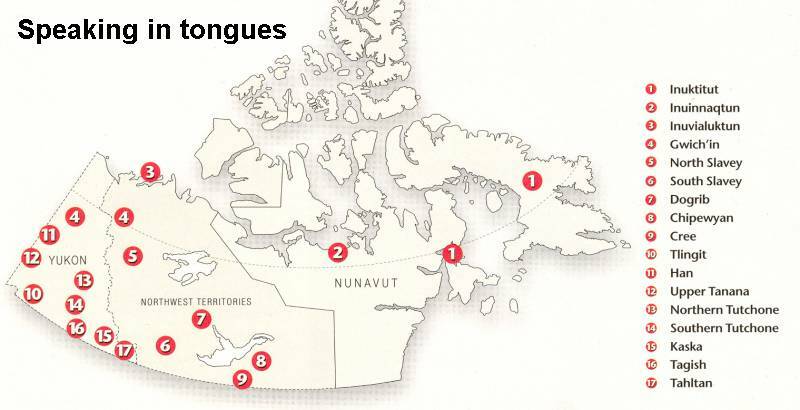 Nunavut is more homogeneous than its western neighbours, with its inhabitants speaking one of the many dialects of Inuktitut, such as Inuinnaqtun of the Arctic Coast. But the map tells the story better. Use it to check out where the various languages are spoken in the lands North of 60°.